Cast your fire and the ruby flames as you descend into the party scene! 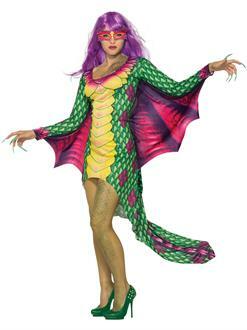 Get the Women's Dazzling Dragon Dress Costume with Mask for a regal look that flaunts your figure. The bodysuit comes with a hood and mock horns and wings attached. The yellow underbelly with black lines make the final touches on this dazzling delight. Get it today!